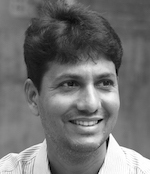 Anil Majumdar was born in 1976 in Ahmedabad. In 1999 he received his Diploma in Painting from C. N. College of Fine Arts, Ahmedabad. In 2001 he received his Post Diploma in Print Making from M.S. University, Baroda. In 2000 he took part in ‘In Pursuit of Individual Impression’ at Ravindra Bhavan Gallery, Delhi. In 2003 he participated in That’s The Show at Jehangir Art Gallery, Mumbai. In 2005 he took part in a group show at Lanxess Abs Gallery, Baroda. In 2011 he took part in A4-Paper Show, a travelling show at Kanoria Centre For Arts, Ahmedabad; AQ Priyasri Studio, Baroda and Priyasri Art Gallery, Mumbai. In 2012 he participated in a group show at Faculty of Fine Arts, Baroda. In 2013 he participated in The Affordable Graphics Show at Kanoria Centre for Arts, Ahmedabad. In 2013 he took part in a group show at Darbar Hall, Kochi. In 2015 he participated in Musings at Vincent Art Gallery, Ahmedabad. In 2016 he took part in a group show, Labyrinth of Tales I at Gallery 7, Kalaghoda, Mumbai. In 2000 he took part in the 109th All India Art Exhibition by Bombay Art Society at Jehangir Art Gallery, Mumbai. In 2002 he took part in group shows, Images on Images and Affordable Art at Kanoria Centre for Arts, Ahmedabad. In 2002 he participated in the Kala Ghoda Festival, Mumbai. In 2007 he took part in ‘Vyakta-avyakta’ at Birla Academy of Art and Culture, Kolkata. In 2008 he participated in Show Your Hope at Global Mobile Exhibition, Amsterdam. In 2010 he participated in a group show, 150 Years of Service to the Nation at Ravishankar Art Gallery, Ahmedabad. In 2010 he took part in Contemporary Print Making in India at Jehangir Art Gallery, Mumbai. In 2010 he took part in Art Fusion at Nehru Art Centre, Mumbai. In 2014 he took part in a group show at Aakruti Art Gallery, Vadodara. In 2015 he participated in KCA 1984 - 2015: A Journey Through The Years at Jehangir Art Gallery, Mumbai. In 2015 he took part in World Stainless Steel Art Festival at Mahatma Mandir, Gujarat. In 2015 he took part in Mini Print Goa, Goa. In 2002 he attended a graphics workshop by Y. K. Sukla Foundation at Kanoria Centre for Arts, Ahmedabad. In 2007 he attended Kala Utsav, a graphic workshop at Rashtriya Lalit Kala Kendra, Lucknow and a graphic workshop at Gujarat State Lalit Kala Academi, Ahmedabad. In 2013 he attended Lithography workshop at Uttarayan Art Foundation, Jaspur in Baroda. In 2000 and 2003 he won awards at the 40th and 43rd State Level Art Exhibitions from Gujarat State Lalit Kala Akademi, Ahmedabad. In 2001 he won an award in the 15th All India Art Exhibition at the South Central Zone Cultural Center, Nagpur. In 2014 he won an award in the IIIrd Distinction at Intercontinental Biennial of Small Graphic, Romania. Anil lives and works in Ahmedabad.